The Baldwin Hills Oil Field in Los Angeles, a 1,000-acre area that's been drilled for some 90 years, is reported to be the largest urban oil field in the country. Activists and neighbors are concerned about the use of "fracking" to access underground oil at the site. California’s once little-known and little-regulated fracking industry is once again coming under fire from environmentalists. Several environmental groups on Tuesday filed a lawsuit in Alameda County Superior Court, suing state regulators over the controversial practice of hydraulic fracturing, hoping to force regulators to devise new rules as they extract oil and gas from the Earth. Click here to read lawsuit. 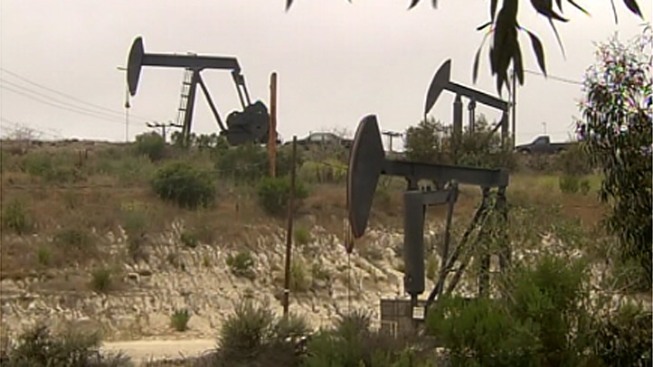 In April, NBC Bay Area's Investigative Unit first exposed the widespread and unregulated use of hydraulic fracturing, commonly known as fracking, to release oil and natural gas taking place in California. The lawsuit claims the Division of Oil, Gas and Geotherman Resources (DOGGR) failed to properly evaluate the risks of fracking, required by the California Environmental Quality Act. Fracking was used for 600 wells in the state last year. The lawsuit was filed by an environmental law firm, Earthjustice, on behalf of the Center for Biological Diversity, Earthworks, Environmental Working Group and the Sierra Club. As it stands today, California does not regulate fracking. NBC Bay Area Investigative Unit Reporter Stephen Stock talked to the state's top regulator, Tim Kustic, who acknowledged that California dropped ball on fracking regulation. You can see that exclusive on-camera interview with Kustic on Wednesday on NBC Bay Area News at 6 and 11 p.m.